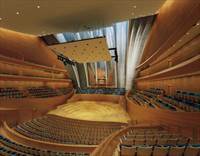 The Kauffman Center is the performance home for three of Kansas City’s premier performing arts organizations and keeps them unified under one roof. A greater range of programming is now possible, when compared with the technical and scheduling constraints at the historic Lyric Theatre, the previous home of all three organizations. Kansas City Ballet – Nationally recognized as one of the country’s leading companies, the Ballet enriches the cultural landscape of the Kansas City region through exceptional performances, touring engagements, community outreach activities, and Kansas City Ballet School. Under Artistic Director William Whitener, the 25-member company performs three mixed repertory programs per year with a focus on the rich history of American ballet. Eclectic programming ranges from classics to contemporary ballets, as well as the ever-popular The Nutcracker. The Ballet is home to Kansas City Ballet School, which serves more than 600 students each year. Lyric Opera of Kansas City – A cornerstone of the Kansas City cultural community and the city’s oldest professional performing arts organization, the Lyric Opera presents four operas each season—all sung in their original languages. Under the leadership of Artistic Director Ward Holmquist, the Company has gained national and international recognition, presenting a broad range of repertoire including several works by major American composers and three world premieres. The Lyric Opera reaches over 20,000 community members annually through its innovative, nationally-recognized education and outreach programming which is designed to further music and arts education in public schools and in the broader community. Kansas City Symphony – The Kansas City Symphony is the region’s only full-time professional orchestra and is a major force in the cultural life of the community. Under the artistic leadership of Music Director Michael Stern, the Symphony’s eighty full-time musicians perform more than 50 concerts each year, and also serve as the orchestra for Kansas City Ballet and Lyric Opera of Kansas City. Praised for providing performances of uncompromising standard, the ensemble often welcomes guest artists of international acclaim as part of their classical and pops subscription series. Complementing its full schedule of concerts, the Symphony strives to enrich the lives of Kansas City residents by providing music education opportunities for children and adults. Highlights each season include a range of free master classes, events, and concerts reaching over 100,000 community members each year.